If you want to get in my good books, all you’ve got to do is show up with cupcakes. That’s what I’ve decided recently. I don’t know where this love sprung from. I think it may have started quite some time ago while watching Victoria Gotti scarfing down cupcake upon cupcake on her A&E show (now cancelled) “Growin’ up Gotti”. Or it could have been during day camp when I was 6 years old while frosting a Betty Crocker chocolate cupcake with straight-from-the-can rainbow sprinkle vanilla icing. Those were the days. 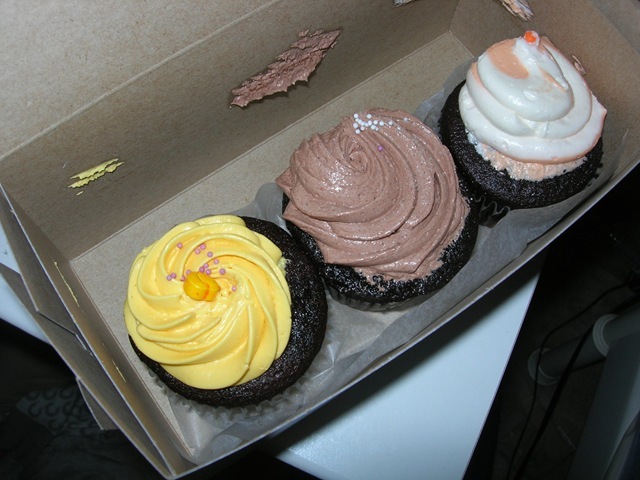 My nostalgia for these innocent but devious cakes brought me to The Cupcake Shoppe on Yonge. 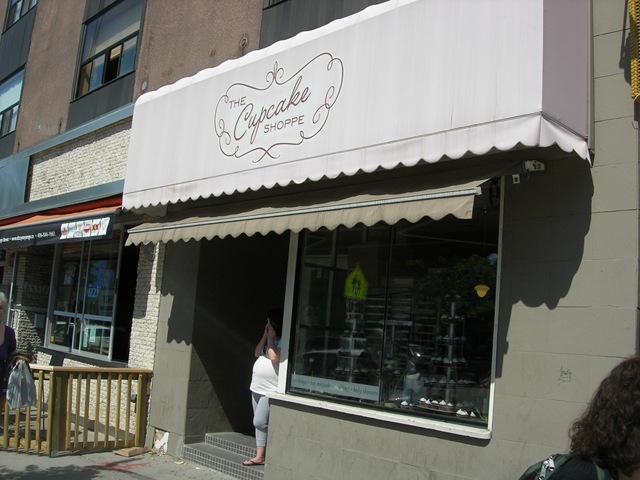 A quaint little shop, it’s square footage allows for no more than 4 customers in store at a time. Inviting displays of vanilla, chocolate, and marble cupcakes are topped with multi-coloured frostings indicative of their flavour. Quirky names are given to each cupcake, sometimes requiring the menu to be able to decode. Cupcakes are sold for $2.75 each or 6 for $13. My selection included James Brown (Chocolate frosting), Mango Madness (Mango Frosting), and Creamsicle (Orange/Vanilla frosting) all on chocolate cupcakes. The cupcakes themselves were not over the top chocolatey. They were balanced, had a light crumb, and were moist overall. Pretty standard in cupcake terms. 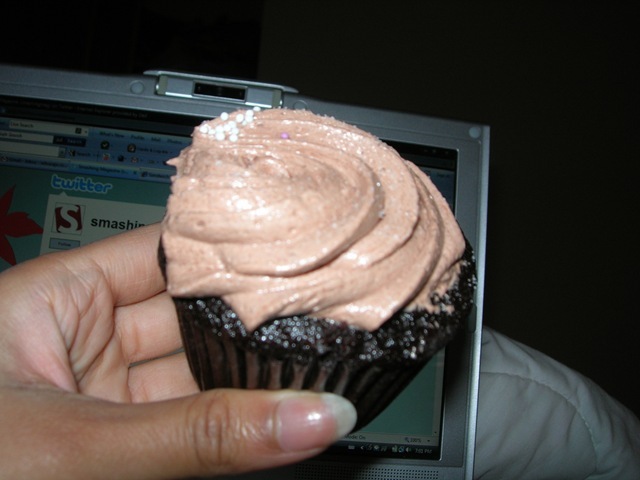 The quality of the frosting varied from cupcake to cupcake. I enjoyed the James Brown and Creamsicle frostings because they stayed true to their flavour description. Creamsicle was especially surprising because the punch of vanilla and artificial orange flavouring served as the perfect throw back to the Dickadee man’s (Ice cream man’s) popsicle of the same name. What was less appealing was the mango frosting. With each bite, I felt like I was consuming a stick of butter. 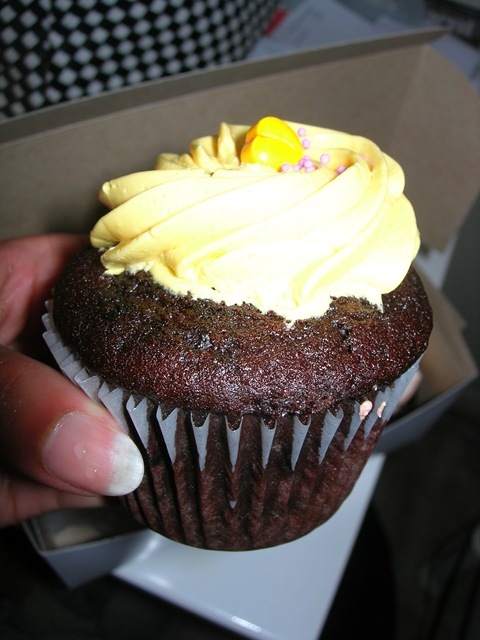 The mango flavour was not prevalent even when I tasted the frosting on its own. It’s definitely something that the owner’s should re-experiment with. The cupcakes did satisfy my craving. What was nice about each one, is that it was either topped off with a sprinkle or a piece of candy in the flavour of the frosting. It was a cute surprise I was not expecting. I requested permission to take photos inside the store, but was unlucky. It’s so cramped in there that I think their objective is to get people in and out as quickly as possible. My advice is to research their menu before going in so that you know what you want. Keep in mind that they have on display approximately 8 flavours out of a roster of 16. So don’t be disappointed once you get there to find out one of the flavours is missing. As I continue to dream of cupcakes, their light and fluffy frosting, and sprinkles galore, please note I make friends really easily, especially when they present me with cupcakes. A secret bakery trick is to make sure the cupcake is covered entirely in frosting (No cake showing). This prevents the cake from drying out even if stored for a couple of days. These guys don’t do that unfortunately. The more frosting the better! Those cupcakes look delicious. Now I know what to get you when you are mad at me. CUPCAKES GALORE! What an adorable cup-cakes! I’m so impressed.